Does the difference between Helvetica and Arial mean anything to you? Do you have a preference for serifs? If so, Typewar and The Font Game may be up your typographically inclined alley. For those with an expressed interest in typography, being able to spot the differences between fonts can often be a point of pride. Personally, when it comes to type, my eye is amateur at best, but both Typewar and The Font Game can be fun for beginners and seasoned serif spotters alike. Font Spotter: In Typewar, you pick between two choices for what font you’re looking at. The game is ongoing, with you moving up levels and spots on the leaderboard with each correct answer. Typewar by Massively Overrated is the companion app to the Website of the same name. The concept of Typewar is simple: you’re presented with a large, uppercase letter. Below are two font choices. You tap on the name of the font you think you’re looking at, and the game informs you if you’re right or wrong. As you play, you accumulate a running point total along the bottom of the screen. (If you guess correctly, points are added. Guess wrong and they’re deducted.) You’ll advance through numbered levels, and as you advance, additional fonts get added to the game. That gives you something to look forward to, as the pace of the game is fairly slow and repetitive. It’s amazing what a breath of fresh air Gill Sans can feel like after you’ve been choosing between Helvetica Neue and Verdana for ten minutes straight. The longer you play, the more fonts get unlocked, and the wider selection you have to chose from, increasing the difficulty. Even as Typewar gets more challenging as fonts are added, there are still plenty of opportunities to choose correctly, simply by recognizing that the letter that is being shown is sans-serif, and there is only one sans-serif option available. The potentially confusing part about Typewar is what the scoring actually means. If you choose to register and log-in (which I recommend), your score is compared to a running overall leaderboard. As you continue to answer correctly, you’ll see your ranking move slowly up a few spots. Moving up the leaderboard is really all there is in a traditional “game” sense. There is no time limit, or start and end (unless, theoretically, you top the leaderboard, I suppose). If you quit Typewar, your game and scores pick up right where you left off. 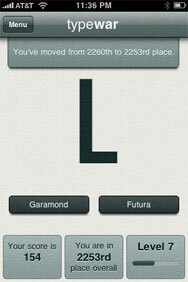 Think Fast: The Font Game is more quickly paced than Typewar. You have four font options here, and multiple difficulty levels. You also have to beat the clock. If Typewar is a font challenge that builds over time, Justin Stahl’s The Font Game is, in many ways, just the opposite. The Font Game is all about getting the most number of correct answers (out of 30) in the shortest time possible. When you begin a game in The Font Game (after choosing from three difficulty settings), you are presented with a word on the top of the screen, and four possible fonts below. You tap the font that you think is shown, find out whether you’re right or wrong, and move onto the next screen. All the while the clock is ticking. After 30 selections, you get to see a scorecard, which lists the number of correct choices you made as well as your time. One of my favorite parts of The Font Game is on the scorecard. Below your score and time, you have the option to see the correct answers. When selected, a panel pops up that shows you each font you saw during the game, the correct name, and a green check or red “X” depending on whether you made the right choice. The pace of The Font Game is so quick, that I would often see an interesting font that I’d want to look at more closely, but would not be able to without sacrificing time in the game. The correct answer pane allows you to study individual type examples, outside of the game setting. It’s a nice way to discover—or be reminded of—fonts you would like to remember in the future. As expected with games focusing on typography and design, both Typewar and The Font Game are well designed, easy-to-use apps. When it comes to iPhone games, I lean toward ones that can be picked up and played in short bursts—The Font Game enjoys the edge here over Typewar. 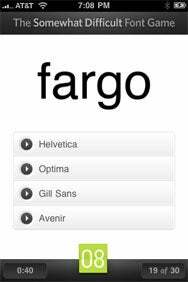 The Font Game also exposes you to a wider variety of fonts in a shorter amount of time, which I found appealing. Typewar, while entertaining, feels like it drags on too long. If the levels were a little shorter, and the new fonts were added at a slightly quicker pace, it would help the game a lot. If you’re looking to sharpen your font-spotting skills, you can kill a lot of time in either Typewar or The Font Game. Who knows—you may even have your eyes opened to a new font that you can put to use somewhere else.